6 v. : ; 28 cm. Issue for Oct.-Dec. 1962 issued in combined form. Customs by importers. Under the direction of Lester D.
Business and Defense Services Administration, Thomas J. 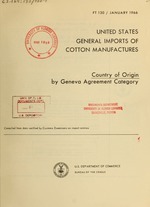 Cotton Statistics, Report FT 130, January 1966. For sale by the Bureau of the Census, Washington, D.C. 20233. Price 10 cents (single copy). Subscription price: S1. shipments between these outlying areas are not reported as U.S.
considered to be U.S. imports and are included in this report. reported on informal entries (items valued not more than $2501. entered into bonded storage warehouses immediately upon arrival. to a subsequent month (usually the month immediately following). with the use of electronic equipment. the cotton component of the commodity only. upon request to the Bureau of the Census. reports, request should be made to the Bureau of the Census. July 21, 1961 entitled "A.angeeantn Rega.d.ng Interno.ronol Trode n Cotnon Teeil, e.
menl Ageement Category descrptlon Octobei 1965 Cufien! July 21, 1961, *n'.ilod ,.Jon1engie Rea.ding Ineeneo rial Trod in: Coflon T7IulI. 39 GLOVES A MITTENS DOZ 193 . 48 RAINCOATS 3-4 AND OVER 301 2271 .
co*r and un.i ol quanlil Io ], Mw r.
LTh. taMbl . *idh tHit. prs pn, quIan tly a. fwr United rSfr:s gwm i ip.ct. of cotton Kn nufac.urfw. n cout. y of origin by -e.dity aeangemgt.) t.. of t. 64 -ea41iny tefrtie 4 Ct*4 .u t. A 3 t9. July 21, 1961. eMtitlil *Arriangmin(t Rarding Inernatad C Td, n- Con- Tel!C".